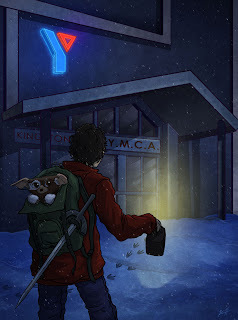 Next piece in line for the Ghostbusters, Gremlins, Goonies show that'll be in LA next month. Here's my submission for Gremlins. I re-watched this recently with the Boyfriend for reference. I could have picked so many different scenes, but I found myself laughing hysterically when Billy is running after 'Stripe' into the YMCA (right before the gremlin cannonballs into the pool). I found so much delight in this scene because he has his house's sword strapped to his backpack when he runs up to the building. I don't know why, but a backpack filled with an electronic-puppet/Mogwai, and a sword strapped to it just seems far too entertaining... Enjoy! Flipping awesome! These last two are blowing my mind. Totally cool. You still rock.